As most had expected, Wednesday’s vote of no-confidence in the UK government failed to pass. Despite all the opposition to the Prime Minister’s Brexit deal, Conservative and Democratic Unionist Party (DUP) lawmakers stood behind the government. But while the no-confidence vote presented few surprises, what Labour decide to do now could be pivotal for the way Brexit pans out. Markets have come away from the past few days with two main conclusions. Firstly, the more cooperative tone struck by the Prime Minister in the aftermath of Tuesday’s heavy defeat on the Brexit deal has led investors to conclude she will seek cross-party support on her next steps. Secondly, markets are now betting that an Article 50 extension is becoming much more likely – in turn reducing the chances of the UK exiting with no deal on 29 March. As a measure of the relative calm surrounding the pound, our FX strategy team estimates that there is virtually no risk premium in EUR/GBP at present, compared with 3-4% last summer amid the fallout from the government’s so-called Chequers plan. But while we think both cross-party cooperation on Brexit and an Article 50 extension are becoming increasingly likely – perhaps even inevitable - the road to getting there could be bumpier and longer than markets are currently expecting. For one thing, the government’s initial ‘Plan B’ is to try and find a way of reshaping the existing deal to get through Parliament, rather than immediately looking to entertain alternative Brexit strategies. This, in turn, means the decision to apply for an Article 50 extension may not be quite so forthcoming, and it's worth reiterating that the EU has signalled a legitimate reason is required to gain the unanimous EU approval needed for an extension. As things stand, that box remains unticked. But Labour's tactics matter too in all of this, and it seems leader Jeremy Corbyn has two main choices over coming days. In the aftermath of Wednesday’s failed confidence vote, the Labour leader is now under immense pressure to put his weight behind a second referendum. According to Business Insider, 71 out of 229 Labour MPs had publically backed a second referendum as of Wednesday morning. But so far Jeremy Corbyn appears reluctant to go down this route. The Labour leader reportedly believes a second vote could be divisive, while he is also widely perceived as more Eurosceptic than some of his party colleagues. Corbyn also appears keen to shift attention back to his domestic political agenda, which could be made more complicated given that a second referendum could take several more months to arrange. Polling also gives Corbyn a conundrum. A poll by Survation for the Daily Mail earlier this week indicated that Labour support could slip by four points if it were to back a second referendum. That said, if there was another referendum, then a YouGov poll from earlier in the year suggested that the vast majority of Labour voters – 71% - would back remain. In short, as things stand the Labour Leader appears reluctant to get behind a second referendum, and that was arguably evidenced by the Labour Party's decision to reject Brexit talks with the government on Wednesday night. Unlike the vote of no confidence in Theresa May as Conservative Party leader back in December, which now cannot be repeated for 12 months, there’s nothing stopping the Labour Party tabling fresh motions of no-confidence over coming weeks. Here, the Labour Leader may spot a potential opportunity. Assuming the Prime Minister’s attempt to renegotiate with the EU proves futile, then a few ministers have reportedly hinted that the government may be prepared to walk back from some of its current red lines. There have already been a few subtle hints that the Prime Minister could inch slowly towards the idea of a permanent customs union with the EU - although officially nothing has changed so far. After all, the all-UK customs arrangement that forms part of the Irish Backstop in the existing deal is arguably only one step away from this anyway. While this strategy may begin to win over some lawmakers from the opposition parties, it would inevitably test the loyalty of pro-Brexit Conservative and DUP lawmakers. At this point, the Labour Leader may choose to table another motion of no-confidence in the government in the hope that some of these disgruntled MPs decide to try and oust the government. There are still many ‘ifs and buts’ in all of this, not least that the bar for Conservative MPs to vote their own party out of government is very high, despite all the concern surrounding the deal. It also seems that some of the other smaller parties in Parliament are wary of Labour’s next steps. ITV’s Paul Brand reported on Wednesday that the Scottish National Party (SNP) and Lib Dems (amongst others) were considering writing to the Labour Party to suggest they won’t necessarily get behind a repeat no-confidence vote. The logic: to try and make this second option trickier/less certain for Corbyn, and in turn put more pressure on him to get behind a second referendum sooner rather than later. Nobody really knows for sure how any of this will pan out, but we're inclined to say that things are unlikely to shift rapidly. While some kind of cross-debate may be the only way to resolve the impasse, the government is set to reshape its deal from the current starting point and May is likely to begin discussions initially within her own party before crossing party divides. Meanwhile, the Labour Party is likely to resist initial pressure to back a second referendum. In the short-term, focus now shifts to Monday when the government is obliged to return to Parliament to outline a new plan. This will be done in the form of an amendable motion, which means MPs can put forward their own alternative proposals. In theory, we may well see MPs force votes on a second referendum or a different Brexit option (e.g. a permanent customs union). At this stage though, there's no guarantee any of these options would command a majority at this stage. 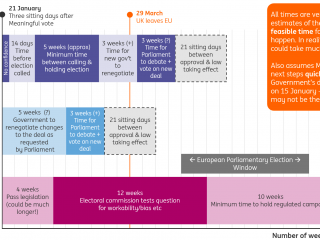 For the economy, the upshot is that it could still be a few weeks before we know whether the Article 50 period will be extended, and potentially much longer before we know for sure whether 'no deal' has been avoided. This means that we're likely to see an increasing number of firms taking action, and this already appears to be playing out in the survey data. Partly for this reason, we expect economic momentum to remain sluggish and we think growth will remain contained in the 0.3% region for the first quarter.